On this experience we take you into the desert on a camel safari, through some of the routes that traders took many hundred years ago. We will camp overnight under the open sky and enjoy the beauty of the desert. On route we will visit the abandoned village of Kuldhara, a desert village and monument of Barabagh. 1.30 pm (Day 1) to 10.00 am (Day 2). This experience is available daily. 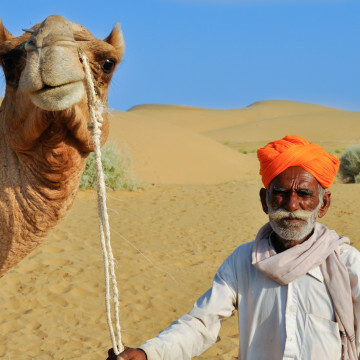 You will be picked up and dropped off from Jaisalmer town. We will leave Jaisalmer town around 1.30 PM on a jeep towards the starting point of our camel safari. En route, we will visit Barabagh, Kumbalgarh and a small Rajasthani village. We will begin the camel safari, with each person on one camel, riding single file. After about 1.5 hours, we will arrive at the sand dunes, the site for overnight camping. You will receive tea and snacks. Sunset over the sand dunes is a magical experience – make sure you get a few memorable pictures before it becomes dark. On this tour, we will arrange clean mattresses on the sand dunes for your comfort, sheets and a quilt in the winter. A bonfire will be lit and cooks will get to work to prepare a simple vegetarian meal for you. After an early breakfast consisting of tea and bread toast, we will hit the road with the aim to leave the desert before the sun starts blazing. Please read through section below to understand all the risks involved on this tour. No toilet facilities – there are no permanent structures in the desert where we are camping, so answering nature’s call has to be done in the bushes. It is not such a difficult thing to do, but something you should be comfortable doing. Insects – life in the desert becomes active at night, for example dung beetles that come out at night to collect dung. These are harmless to humans but are common in the desert. Please note that desert climate can be unforgiving, the sun bears down heavily. We recommend wearing light colored clothing, wear long sleeves covering your full arm and legs. Please read additional information section to understand challenges of camping under a open sky.